Fons Iannelli began photographing at his father’s sculpture studio, Iannelli Studios, in Park Ridge, Illinois. Alfonso Iannelli, Sr. was an esteemed industrial designer, graphic designer, and sculptor. Iannelli, Sr. created sculptures for Frank Lloyd Wright’s Midway Gardens project (1914) as well as the 1933 Chicago World’s fair. Books about Iannelli, Sr. include Everyday Modern: The Industrial Design of Alfonso Iannelli, and Alfonso Iannelli: Modern by Design. Fons Iannelli trained as an apprentice to Gordon Coster, the prominent Chicago industrial photographer. Iannelli opened his own studio in 1940. 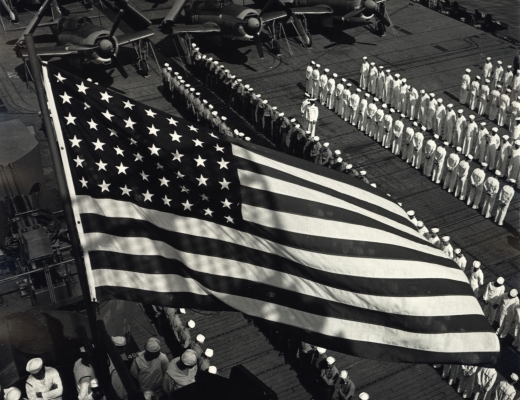 In 1942, he was recruited by Edward Steichen to join the Naval Aviation Photographic Unit, a unit of the U.S. Navy employed to document and publicize its operations in order to recruit Navy pilots. Fons began working with the unit as an assistant and darkroom developer but was promoted to photographer. 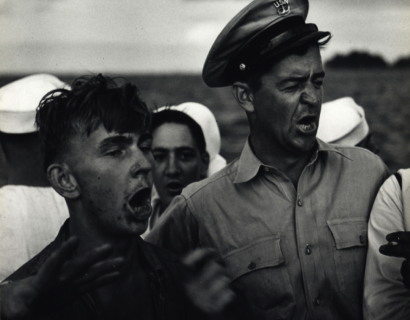 He was given the task of documenting the emotions of the men on the ship and developed his “fly-on-the-wall” style. 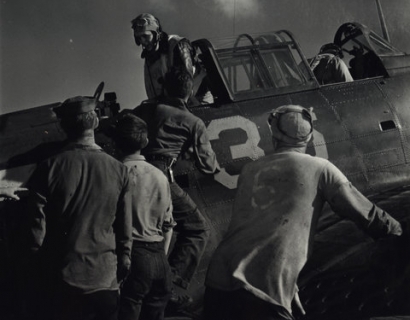 His photographs were published in a collection edited by Steichen entitled U.S. Navy War Photographs: Pearl Harbor to Tokyo Harbor (1945) and were included in the exhibition Power in the Pacific: Battle Photographs of our Navy in Action on the Sea and in the Sky at the Museum of Modern Art in 1945. After the war, Iannelli’s photographs present a complex and paradoxical picture of American life. Iannelli became a highly successful photojournalist for McCall’s, Life, Fortune, Collier’s and The Saturday Evening Post. His photographs for Ladies Home Journal “How America Lives” section sympathetically portray post-war consumerist aspiration. Other images document that the security, happiness, and tranquility promised at the end of the war were elusive for many. By the late 1940's, he was rumored to be the most highly paid magazine photographer in New York. He was known for his ability to overcome difficult lighting situations and is said to have introduced bounce-light techniques for softer lighting into photojournalism. An unpublished story for Harper’s noted that Iannelli was likely the first to use a hand-held camera with a sync system for strobe lights out in the field. He was one of the first photographers to use 33mm film for magazine work and published the industry’s first 35mm color cover, for McCall’s in October 1950. In 1948, Iannelli founded Scope Associates, a photographer-run co-op agency. Several members from Steichen’s naval unit were represented by Scope including Horace Bristol, and Victor Jorgensen. In 1951, Iannelli established his own movie production studio, Filmscope Inc. The company produced and directed several 16mm shorts for Omnibus (1952-1961), an educational television series created by the Ford Foundation that brought science, art, and the humanities into homes via the major TV networks. Iannelli transformed Filmscope into a distribution firm in 1954, and turned his attention to pragmatic technological developments to advance journalistic capabilities in film. Among other inventions, Iannelli is credited with developing a rapid rewind for Leica Camera, the first use of bounced strobes, and numerous designs for advanced tape recorders and motion picture cameras. He provided equipment for the documentary films made by his friend Pete Seeger. Iannelli continued to make photographs and films through the 1980s. In 1982 his studio caught fire and many of his vintage prints and equipment were destroyed. In 1988, shortly before he passed away, he submitted an application to the W. Eugene Smith Memorial Grant to reshoot the Kentucky Coal Miner series to see how the life of the family had evolved over 40 years. The application for the grant was rejected. Iannelli’s son, Kim King, was a guitarist and synthesizer player for the band Lothar and the Hand People. The band is credited with being the first to tour and record using synthesizers, thereby inspiring a whole generation of electronic music-makers. The band jammed with Jimi Hendrix and, performing at the Fillmore East and elsewhere, played gigs with The Doors, The Byrds, Canned Heat, The Chambers Brothers, The Grateful Dead and The Lovin' Spoonful. They played the music for Sam Shepard's play The Unseen Hand, were the opening act at the Atlantic City Pop Festival in 1969. Kathryn Kearney reviews the exhibition Fons Iannelli: War/Post-War for Musée Magazine, remarking on his ability to capture the friendship and camaraderie that bonded together the Navy soldiers. Financial Times comments on the grimy immediacy of Fons Iannelli's war and post-war imagery. 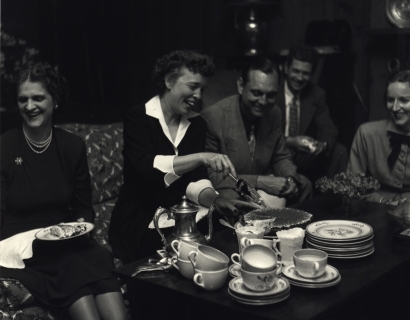 John Otis discusses Fons Iannelli's wartime photos as well as his snapshots of family life in a post-World War II USA.